I'm a newbie in transistor switching. I have PIR sensors with C and NC onboard. NC is 12 V signal that I need to switch transistor (bipolar?) to emit 3.3 V (collector connected to 3.3 V). VCC equals 3.3 V. PIR is pin on ESP32. Can you tell me if this circuit is okay or does it need additional edits? Note: Q3, Q4 transistor number is random, if you can offer me suitable transistor I would be glad. ESP32 pin "ALARM" is connected to transistor (MOSFET N channel) base. 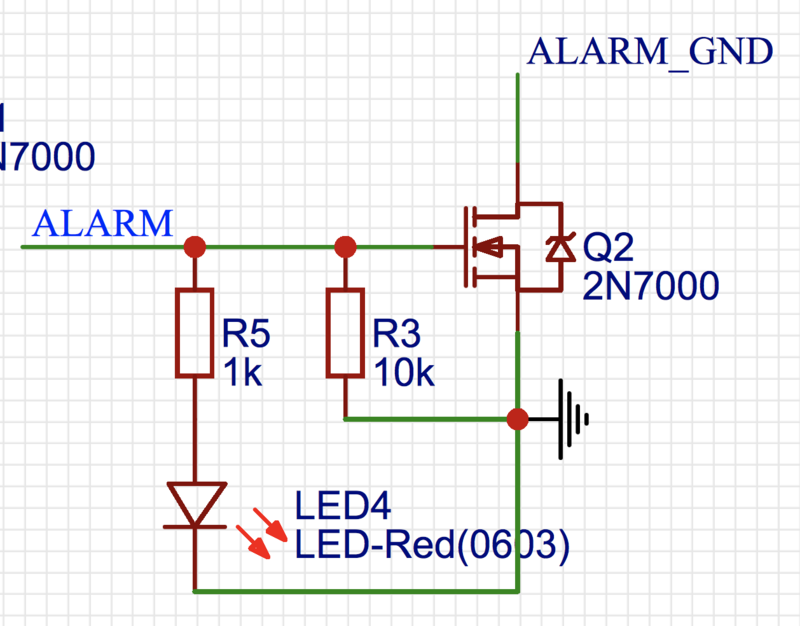 ALARM as device is connected to 12 V, required 300 mA to run and I need transistor to switch circuit. Relay is awful. Do I need any additional edits? Can you suggest me suitable transistor? I don't know much about MOSFET shortcuts. Third circuit I need is same as this but instead 12 V I need to switch 5 V.
I guess just to change MOSFET transistor? Or use same as for 12 V? I'll try to answer your post with "just words" and we will see how it goes. If it is not clear to you, i will post small schematic. 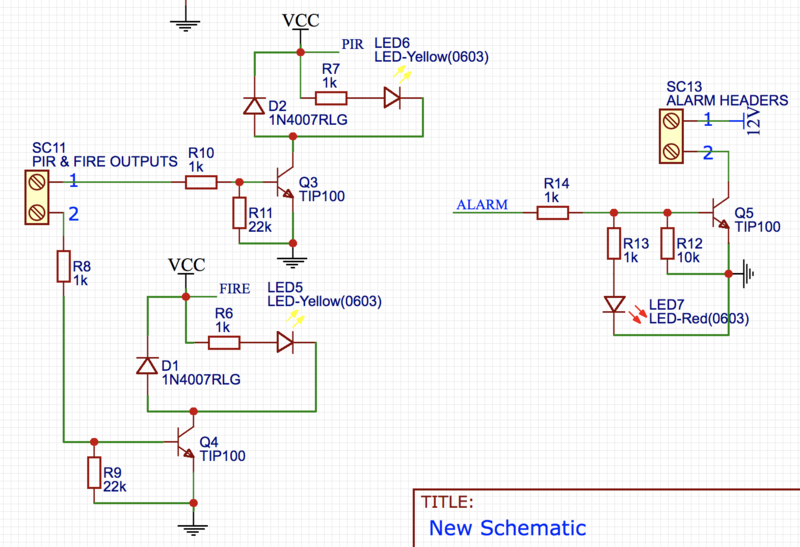 I do not recommend the first schematic that you posted. You will likely reverse bias the BE (base emitter) junction with 12v. Most bipolar transistors have a maximum reverse BE bias of 5 v.
I do recommend using bipolar so that you dont have to study, understand the range of turn on voltages for a MOS transistor. The bipolar is always 0.6v and a Darlington bipolar is twice that. Also, i dont know why you have the 100nF caps in there. They will guarantee a surge, everytime you turn the circuit on and hence put noise on your supply bus. So use the basic design of your second circuit but use the TIP100. ALWAYS have a resistor (10k ohms or so) to keep the leakage current (Icbo) from turning on the transistor when you dont want it on ! I would put all the loads into the Collector circuit in your second schematic, rather than make the uP drive your LED. If your load is at all inductive (a coil) then ALWAYS put a reverse-biased diode across the load to catch any inductive kick back. If this is all Greek to you, then just say so and I will draw a simple universal circuit that will work for 3.3v drive or 12v drive. Not the answer you're looking for? Browse other questions tagged switch transistor mosfet or ask your own question.